Weaving timeless operatic arias amid soaring rock melodies, with a powerhouse rock rhythm section, with strings, woodwinds, brass and backing vocals, Alexander’s music leaves you exhilarated and breathless. 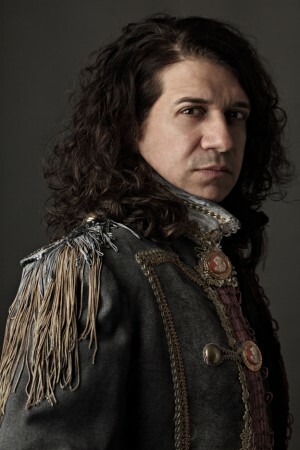 His self-titled debut CD, for release February of 2014 (SONY/Red), is the culmination of an incredible career, both as one of the most distinctive operatic tenor voices on the international music scene, and as a powerful and searing rock voice in the grand tradition of Steve Perry and Freddie Mercury. An accomplished multi-instrumentalist and linguist, Alexander enlisted the exceptional talents of the iconic jazz saxophonist David Sanborn who joins Alexander in a beautiful jazz/opera fusion song called Ho Bisogno Di Te. Darryl “DMC” McDaniels from the super rap group RUN DMC also joins Alexander in a hip hop/opera collaboration of a remix of Alexander’s original composition called Vesti la Giubba – Hide the tears. Classically trained in Opera, Alexander has studied with a Who’s Who of vocal masters, from Arrigo Pola (the late Luciano Pavarotti’s voice teacher, Modena, Italy), Gianni Raimondi (La Scala, Italy), as well as Dan Marek, John Wustman and Nico Castel (Metropolitan Opera). Alexander is a full scholarship graduate of the Mannes School of Music in New York City (B.M. ), and Northwestern University (M.M.). As a lyric tenor, Alexander has performed internationally, with appearances at Avery Fisher Hall, The Berlin Philharmonic and has perform alongside Tony Award winning actress Elizabeth Ashley in the Columbia Artists/Broadway tour of “Master Class” by Terrence McNally. The recording is rounded out by keyboardist/orchestrator and music director John Conte (Stewart Copeland, Manhattan School of Music, Banff), engineer Roy Hendrickson (Paul McCartney, Roberta Flack, George Michael), top-tier NYC musicians including The Metropolitan Opera Orchestra, Ethel (the progressive classical string quartet), Alan Michaels (Drums, Broadway -West Side Story, Chorus Line), Kevin Brown (Bass), Aimee Willis (backing vocals, Deustch Oper Berlin), guitarists Ben Butler (Rod Stewart, Bono, George Michael) and Michael Aarons (Paul McCartney, Elton John, Placido Domingo, Ray Charles). The CD was recorded and mixed at; Avatar Studios and MSR in New York City, and St. Claire Recording Company in Lexington, Kentucky. The recording is mastered by legendary Ted Jensen, of Sterling Sound in NYC.